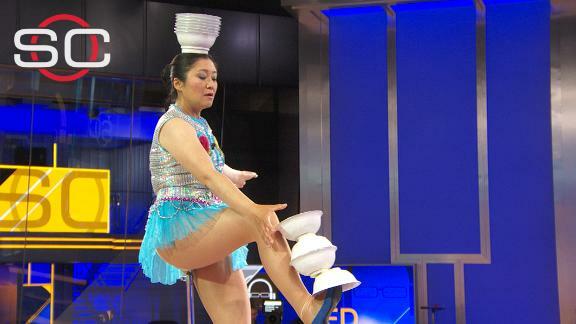 Rong Niu, "Red Panda," joins SVP and Kenny Mayne to perform her usual NBA halftime routine in the SportsCenter studio and successfully balances all bowls on her head while riding a unicycle. Rong Niu had been pitching her acrobat audition video to NBA teams for a halftime show for nearly two years without hearing a word of interest. She was working relentlessly at the time, feeling like she performed at every school and corporate event possible. Finally, on Thanksgiving Day in 1993, she received a call from the Los Angeles Clippers. Their scheduled halftime act for the game that night had to cancel, and the team was wondering if she could fill in. She jumped at the chance and hopped on the next flight from her home in San Francisco to Los Angeles. While Niu was anxious about her first real opportunity and took the court with butterflies in her stomach, she was stunned to finish her routine to a standing ovation. It didn't take long for the Clippers to book her again. 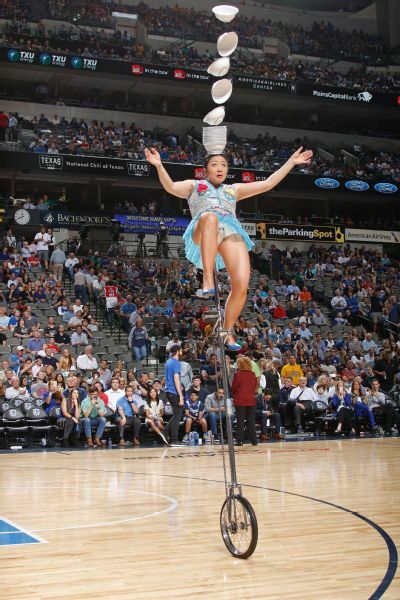 Rong Niu, known as Red Panda, has been stunning basketball crowds with her routine atop a 7½-foot unicycle for more than two decades. Today, Niu, or "Red Panda" as she's known by fans, is one of the most in-demand performers in the NBA and college basketball ranks. She has performed for every NBA team, save for the Miami Heat, and while she's not currently scheduled to perform in the NBA Finals this year, she has on three previous occasions. Niu, now in her mid-40s, is a fourth-generation acrobat and grew up in Taiyuan, China, where she watched both her parents make a living as professional performers. She says she loved watching them, and it wasn't long before she herself was bit by the entertainment bug. She started learning from her parents at age 7 and eventually began attending a boarding school focused on acrobatic arts. Her father was a teacher at the school, and he began instructing her on traditional Chinese practices. When she was about 11, the pair started altering a well-known routine, one that involves the performer flipping bowls onto her head from her foot while balancing and riding around on a 7½-foot-tall unicycle. But her father had an idea. Instead of stacking bowls within each other on her feet, he thought she should try stacking them end-to-end, and then flipping them onto her head. "We tried it, and when [the bowl] went in, we were all shocked," she says. "We started practicing and kept on going and going, and when we got two bowls, we moved onto three bowls. It just went from there." She spent the next several years perfecting her act -- from creating the right costume to finding the perfect unicycle and bowls (metal, as ceramic could damage floors). Niu joined the famed Shanghai Acrobatic Troupe as a young teenager, Niu traveled the world and gained valuable experience performing her routine regularly. She was especially enamored by the response she received from American crowds, who almost always rewarded her with thunderous applause, and eager fans who wanted to talk and praise her after the show. When she was 19, Niu made the move to Orlando, Florida. With Disney's blessing, she spent her downtime performing in restaurants, schools and various businesses in the area. After about a year and a half, she decided to move to San Francisco, mostly because of the city's large Chinese population. Without a full-time gig for the first time in her life as a performer, Niu began sending out audition tapes to whomever she thought might be interested. The years all blur together now after that first Clippers game, but she does know she did a handful of games the rest of the season. And during the next season, things really took off -- she guesses she performed at more than 40 games. Riding her unicycle and flipping bowls onto her head resonated with basketball crowds, and she quickly became the rare performer for whom fans would delay using the bathroom or getting a beer in order to watch. 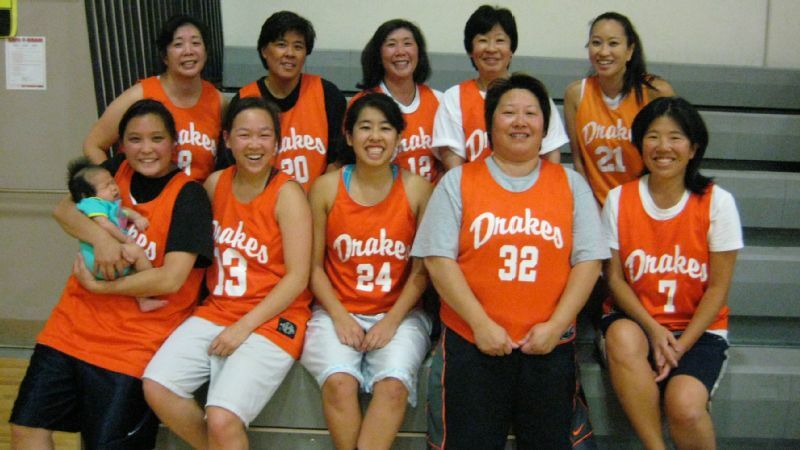 She regularly performs at more than 60 basketball games a season. Some fan bases even consider her a lucky charm and an essential part of their team's postseason. Niu now spends every October through June traveling across the country, essentially living out of her suitcase, going from arenas to airports and back again, to perform her trademark routine. By breaking the unicycle into three pieces, she's able to pack all of her gear into two large, and very heavy, suitcases. But just like any other traveler, Niu says her bags get lost or damaged at least once a season. Because she can't perform without her exact gear, she has to cancel a few shows as a result. She also has had more than a few encounters with bewildered TSA agents who don't understand the contents of her luggage. "I protect [my gear] very well and pack everything carefully," she said with a laugh. "Sometimes at the airport, they try to open [the bags] up and say, 'What is in there?' because normal people don't bring that. Sometimes they don't laugh back when I explain what I do." 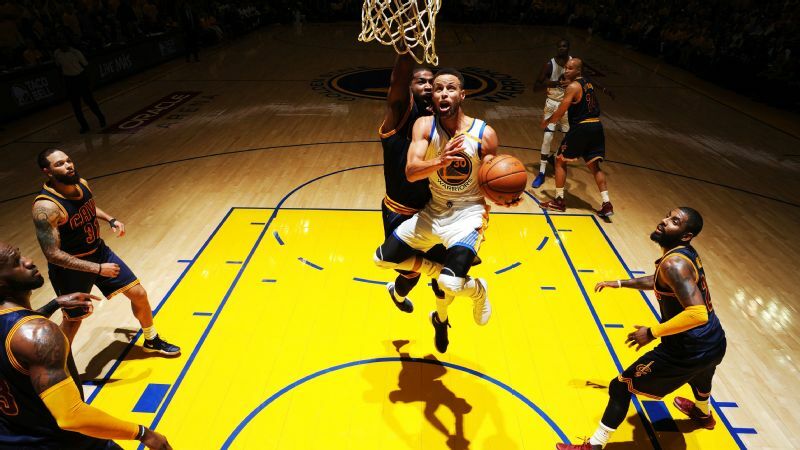 20 Questions: NBA Finals, Jessie Graff's historic run and why 'Wonder Woman' is a must-see! Nearing the end of the 2012-2013 NBA season, Niu received a phone call from the producers of "America's Got Talent," the NBC talent competition show, asking for her to audition for the show. She delighted the celebrity panel of judges and easily advanced to the next round with her trademark routine. Despite her early success on the show, she ultimately decided to quit because her father, who had gotten her started as an acrobat in China, had been diagnosed with cancer. While both of her parents had moved to San Francisco, Niu was the family's only fluent English speaker. She shuttled him to and from doctors' appointments and became his primary caregiver -- missing the entire 2013-14 basketball season to do so. He died 10 months after receiving his initial diagnosis. Even though Niu was devastated, she wanted to resume training in his honor. But she struggled to focus and fell off her unicycle during a practice, breaking her arm. She was put in a cast and sidelined yet again. "I missed it a lot," she said. "I realized how much being a performer means to me. It gives me a sense of worthiness. It's a part of me and I didn't know until then." She didn't perform for two years, prompting rumors that she had retired. But Niu returned to halftime performances for the 2015-16 NBA season. "The first game back was very emotional," she says. "I was thinking about my dad; he taught me the act. ... I tried to focus, but I couldn't stop thinking about him." She has no plans to step away from performing, even after more than two decades. She says she doesn't know the secret to her longevity, but she works hard on her cardio; she likes to run and take long walks. She also tries to maintain a healthy diet. 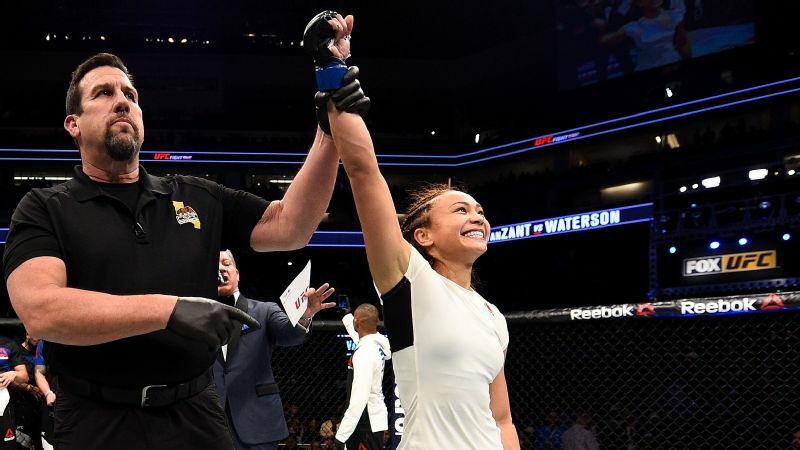 And, as the fans still greet her and cheer for her as warmly as they did that very first night in Los Angeles -- no matter what game it is -- she's mostly grateful for the opportunity to perform, even if she herself doesn't always understand her own appeal. "I am totally surprised by it," she said. "All these years. It's really embarrassing to say, I can only do one thing. My act is the same, exactly the same. It's been 20-something years and they're still calling me back. I am totally surprised. They're not tired of watching me?"